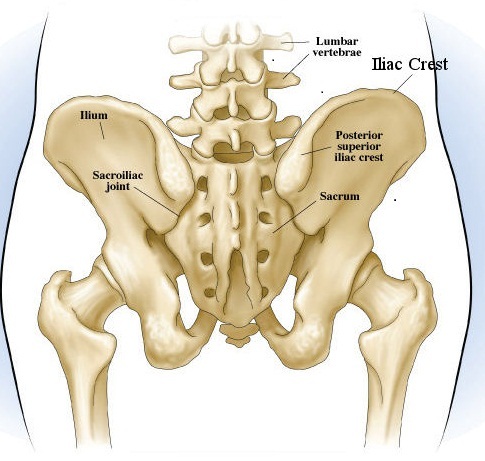 Most who experience pain on the iliac crest describe this sensation as an aching or bruising feeling that develops along the hips. There are many muscles that attach above and below iliac crest that are essential to movement of the body. The hip flexor muscles as well as back and abdominal or core muscles are all active in this area. If these muscles are weak then running or other repetitive motions can irritate these attachment points and cause pain. The iliotibial band is located along the outer thigh and moves to the outer side of the knee joint. Runners and other athletes will often experience hip pain that is centralized to this area. The iliotibial band is responsible for stabilizing the pelvis, so it can be irritated by an imbalance between legs. Putting too much strain on one side of the body can cause discomfort in this area. Piriformis syndrome is typically caused by the luteal muscles becoming too tight and putting pressure on the sciatic nerve, which can radiate throughout the hip and buttocks as the pelvis is caused additional wear and tear. Working out in worn out shoes, inflexibility, length discrepancies of the legs and muscle imbalances can contribute to this condition. Iliac crest pain can often be caused by inflammation of the iliolumbar ligaments.This inflammation can put pressure on the muscles within the pelvis or the lower back. Aggravation in the gluteus medius can cause pain below the iliac crest which can lead to reduced elasticity, reduced flexibility, reduced range of motion, an increase of pressure, reduce nerve or muscle function or reduced circulation to the area. Rest completely for a few days to give your body time to address your symptoms. Gently work your way back into your training schedule to avoid putting too much pressure on the damaged muscles. Placing an ice pack on the sore or injured area of the iliac crest every night will help to reduce swelling and this discomfort. Do not apply ice directly to the skin as this can result in damage to these cells. Gently stretching the core and hip muscles will help you to build strength that will help to prevent injuries in the future. Stretch hamstrings, iliotibial band, hip flexors and quadriceps before each run to make sure the body is ready to take on this workout. You can use anti-inflammatory medications to reduce swelling and limit your discomfort as you begin to treat your pain. Corticosteroids may be injected into the affected area to help take down inflammation of the iliac crest. This is often provided for those that have had limited success with other treatment methods such as ice, physical therapy and rest. Those that are experiencing pain in the iliotibial band may see the most success with physical therapy. Your doctor may evaluate your running style to determine if you an underlying cause may be contributing to this inflammation. Gait analysis, muscle strength and muscle flexibility tests can be used in order to determine how best to avoid causing such damage in the future. Over time your shoes will wear out and will fail to provide adequate support for the feet. Take the time to replace them with something sturdier that will help to provide the necessary shock absorption and stability for your legs. Avoid constantly running on surfaces that are uneven or in areas that are uphill or downhill as these put excessive pressures on the legs.